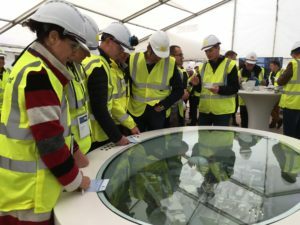 23rd October 2017 – Representatives from cement factories all over the world descended on Platin in October as Irish Cement played host to an three day international CRH event on best practice in the industry. This is Platin’s second year hosting the annual event and Works Manager David O’Brien described it as “a great opportunity to showcase our operations here in Platin”. The 140 delegates from 20 countries including the Philippines, Finland and United States, took part in cement-related technical workshops and seminars on topics including workplace safety, clinker mineralogy, process optimisation, and fossil fuel replacement. But it wasn’t all work as the delegates were also treated to traditional Irish hospitality as they had the chance to visit the Guinness Storehouse in Dublin, listed as one of Europe’s top visitor attractions.